Hi friends, I know it is the end of ramp season and I have been gone for a good while, but hopefully this recipe makes it to you before these beautiful alliums leave us for another year. The past few weeks, besides going to school and stressing out about the days being far too short, I have been tinkering with a recipe for a delicious, sky high, and structurally sound quiche (three things which are surprisingly difficult to achieve in harmony). 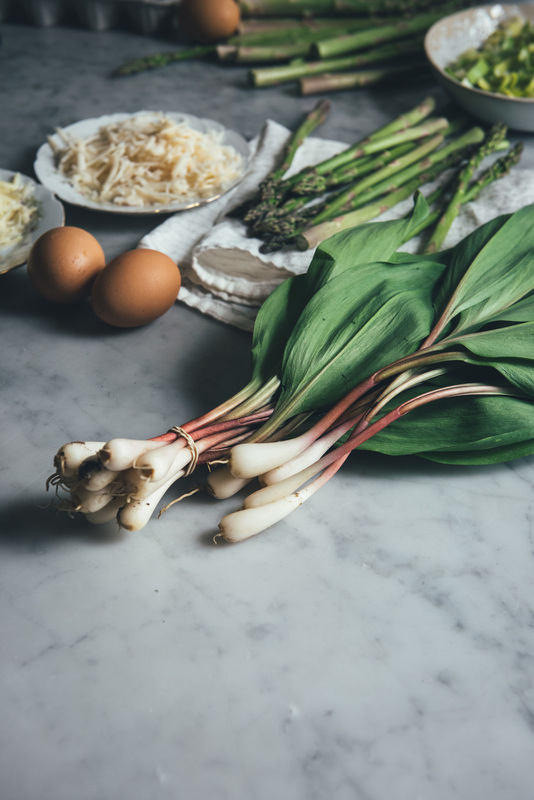 Ramps are about as fleeting as the spring season here, coming and going in a matter of weeks. So this quiche is my attempt to stuff as much spring produce as humanly possible into one recipe before it's too late. 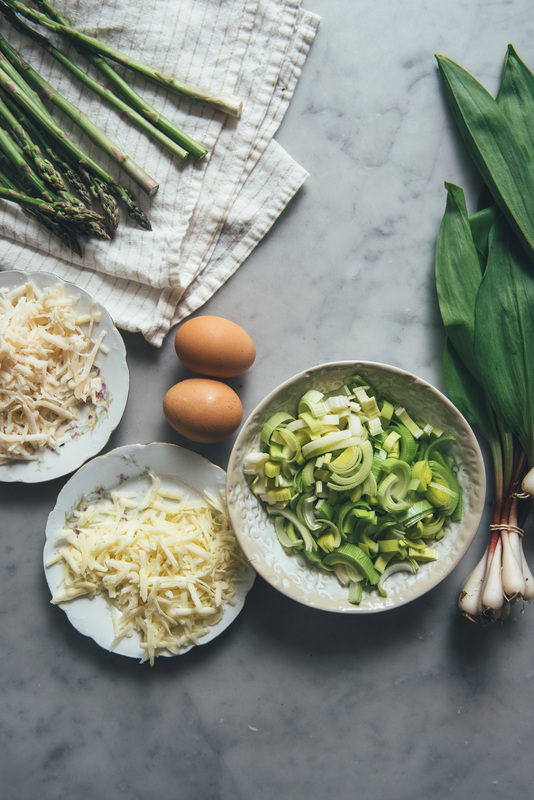 The ramps are paired with some lightly cooked leeks, fresh asparagus, and gruyere, bound together by an egg custard, and nestled in a flaky pie crust. Besides baking a few birthday cakes for friends and making boxed mac & cheese, this quiche has been about the only thing I have cooked lately. Well...that may be a slight exaggeration, but a girl's got a point to make. Time in the kitchen has been scarce this past month. My weekends have been mostly spent outside of the house, enjoying the weather and eating as much food as possible; last weekend we even went grilling for the first time at Brooklyn Bridge park. Because of this, I have so many ideas in my head about what to do with summer's bounty of produce. And rather than simply being a figment of my imagination, I'm hoping they will become a reality soon. In the meantime, enjoy this quiche and we'll talk soon! This recipe is made in an 8 by 3 inch removable bottom cake pan, but if that is too high maintenance, you could also use a regular 9 to 10 inch pie or tart pan and adjust the cooking time down. Yields one tall 8 inch quiche. Make the crust by whisking together flour and salt in a medium bowl. Cut in butter with a pastry blender until the size of small peas. Add ice water and mix lightly with a spoon until it starts clumping together, then take your hands and knead it a few times. Form dough into a ball and wrap tightly in plastic wrap. Refrigerate for at least 30 minutes. Meanwhile, cook leeks with olive oil and 1/2 tsp salt for 5 to 6 minutes over medium-high heat, tossing frequently, until translucent and just beginning to brown. Let cool. Thinly slice ramps and set aside. You can keep 3 to 4 ramps whole for decoration on top if you wish. Preheat oven to 350 degrees F and have an 8 by 3 inch removable bottom cake pan ready. When the dough is chilled, unwrap and place it on a liberally floured counter. Roll the dough out until wide enough to fit in the pan with some overhang. Fold the dough into fourths and gently transfer to the pan. Unfold the dough and press it firmly into the pan, letting any excess dough hang over the edges. Sprinkle half of the gruyere on the bottom of the crust. Then add the cooled leeks in one even layer. Add the asparagus in another layer, then the sliced ramps. If you kept a few ramps whole, gently lay them on top of all the other vegetables, then top with the remaining gruyere. Whisk eggs, milk, cream, and the remaining 1/2 tsp salt together and pour over the veggies. 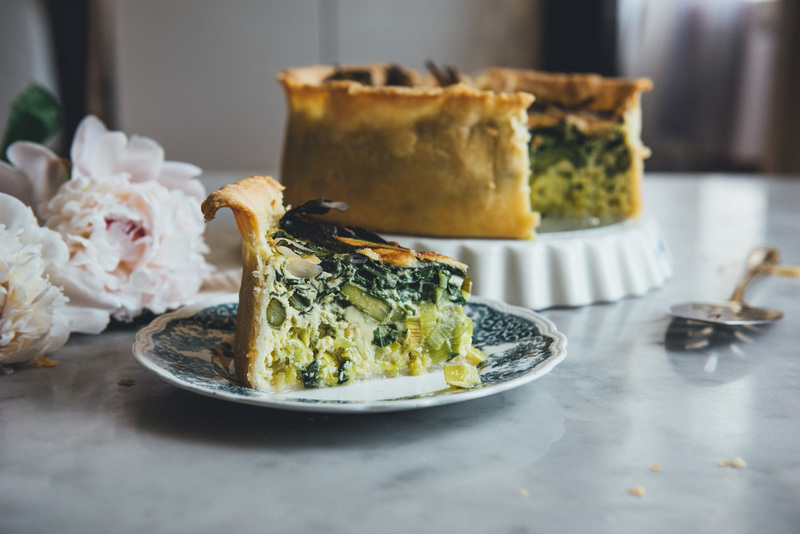 Place quiche on a baking sheet to catch any drippings and bake on the bottom rack of your oven for 1 hour and 15 minutes or until the crust is golden and the center is puffy. Let cool for 30 minutes before unmolding. Slice, serve, and enjoy.